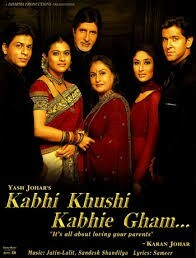 Kabhi Khushi Kabhie Gham… is an Indian drama which explores the troubles an Indian family faces when their adopted son chooses to marry a girl belonging to a lower social class. The film is directed by Karan Johar (Kuch Kuch Hota Hai, Kabhi Alvida Naa Kehna) and also written by Johar with Sheena Parikh. The cast includes Amitabh Bachchan (The Great Gatsby, Mohabbatein), Jaya Bachchan (Kal Ho Naa Ho, Meherjaan), Shah Rukh Khan (My Name Is Khan, Kal Ho Naa Ho), Kajol (My Name is Khan, Kuch Kuch Hota Hai), Hrithik Roshan (Zindagi Na Milegi Dobara, Jodhaa Akbar) and Kareena Kapoor (3 Idiots, Bajrangi Bhaijaan). The production chose to film its main climactic scene in Bluewater Shopping Centre where mother and son are reunited. Bluewater is one of the biggest shopping centres in Europe and is situated in an old chalk quarry bowl. The space is adaptable for a range of events and filming purposes and before it was a shopping centre previously featured in Doctor Who-The Mutants (1972). Kabhi Khushi Kabhie Gham… was released in 2001 and is now available for DVD and online purchase. This entry was posted in Filmed in Kent and tagged Amitabh Bachchan, Bluewater, feature film, Hrithik Roshan, Jaya Bachchan, Kabhi Khushi Kabhie Gham... film locations, Kajol, Kareena Kapoor, Shah Rukh Khan. Bookmark the permalink.